Hours: Monday-Saturday 9:00 a.m. – 5:00 p.m. The Hohokam lived in permanent villages in the Salt and Gila River Valleys, irrigated their crops with river water, and traded throughout what is now the southwestern U.S. for goods from Mexico and Central America. The Akimel O’odham (Pima) people consider themselves descendants of the Hohokam. The Gila River Indian Community, set aside as a reservation in 1859, is still home to Akimel O’odham. 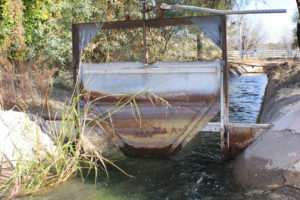 The Gila River Indian Community was adversely affected by the growth of Florence and other non-native settlements, which diverted increasing amounts of Gila River water to irrigate their own fields. The lucrative Akimel O’odham economy, based on selling agricultural goods to settlers and military encampments, slowly collapsed as the river dried up. Ranchers dug Chase Ditch in 1866 along the alignment of a Hohokam waterway and received the first water rights in the area. 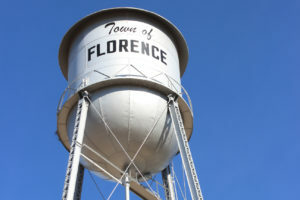 Boosters established the Florence Canal and Land Company in 1886. The town has been an important center for irrigated farming and ranching for decades. As the borders of the Phoenix metropolitan area expand and Florence grows, its economy has diversified. Its website lists major employers as “Pinal County, Town of Florence, Florence Unified School District, Safeway, and nine correctional operations." The town's relationship with corrections actually goes back almost as far as its agricultural endeavor: the Central Arizona prison was built there in 1908, replacing the Territorial Prison in Yuma. 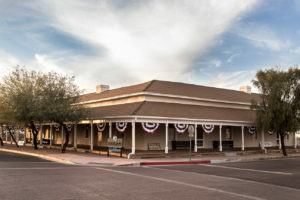 Florence is a tourism gateway, with historic mining towns to the east and the Casa Grande Ruins and Boyce Thompson Arboretum State Park nearby. November 15 - 5:30 p.m. The Pinal County Historical Society will host the Florence exhibit in conjunction with the Smithsonian Water/Ways Exhibition. The museum will have a special preview of the local exhibit with artifacts and presentation boards focusing on "People, Places and Events" relating to water and Pinal County. David DeJong Ph.D. Author & Director of the Pima-Maricopa Irrigation Project and David Snider Chair, Pinal County Water Augmentation Authority & former Pinal County Supervisor each will give a brief presentation. Tickets $10. Limited Seating. Call 520-868-4382 to reserve seat and buy tickets. Saturday, November 17 - 1:00 p.m.
McFarland State Historic Park, 24 W. Ruggles St.
Friday, November 30 - 6:00 p.m.
Saturday, December 1 - 1:00 p.m.
Wednesday, December 5 - 3:00 p.m.
Saturday, December 8 - 1:00 p.m.
Friday, December 14 - 6:00 p.m.
Saturday, December 15 - 1:00 p.m.
Friday, December 21 - 6:00 p.m. The past 20 years have seen archaeologists make great strides in their understanding of ancient Hohokam farming and water management practices. Hundreds of miles of prehistoric canals, capable of irrigating tens of thousands of acres of land, have now been documented across southern Arizona. One of the largest and most successful canal systems was located along the Gila River and was associated with Casa Grande Ruins and the nearby Grewe site. Dr. Craig will discuss the growth and development of the Casa Grande-Grewe community, focusing on the water management strategies that contributed to its long-term success. Friday, January 11 - 5:30 p.m. The state parks system operates 35 park sites throughout Arizona and oversees or maintains numerous trails. Arizona State Parks conducts numerous community engagement and advocacy programs, from educational hikes to grants for trail projects. The library hosts a variety of programs, classes and contests to get residents excited for reading and help them learn more about local culture. The Chamber connects people with the resources they need to grow their businesses and build community. For more than sixty years, the Society has operated a museum that celebrates community history and emphasizes the importance of water to the region.